et présenté sur le site web du musée. (dont Video: Ginevra’s Story - 58 min). Il a été acheté en 1967 aux princes du Liechenstein (plus de 5 M de $). « The daughter of a wealthy Florentine banker, Ginevra de' Benci enjoyed a reputation as an accomplished poet and was herself the subject of several poems by writers in the Medici circle celebrating her beauty and virtue. To convey these qualities, Leonardo painted on the reverse of her portrait a wreath of laurel--the crown of poets--and a palm of fame encircling a sprig of juniper. 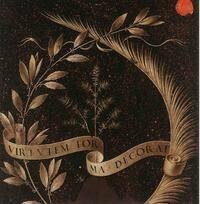 Entwined around the plants is a scroll with the Latin inscription for Beauty Adorns Virtue ». A Florence, parmi les admirateurs de la dame figurent Lorenzo de Medici et Bernardo Bembo, l'ambassadeur venitien. 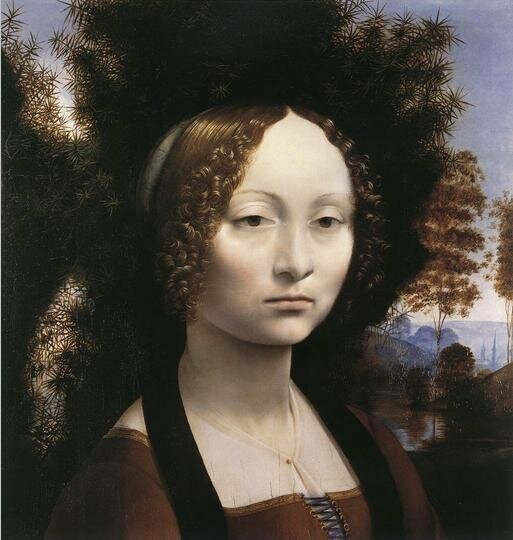 « Ginevra de’Benci is one of the first known three-quarter view portraits in Italian art. She eyes the viewer directly. 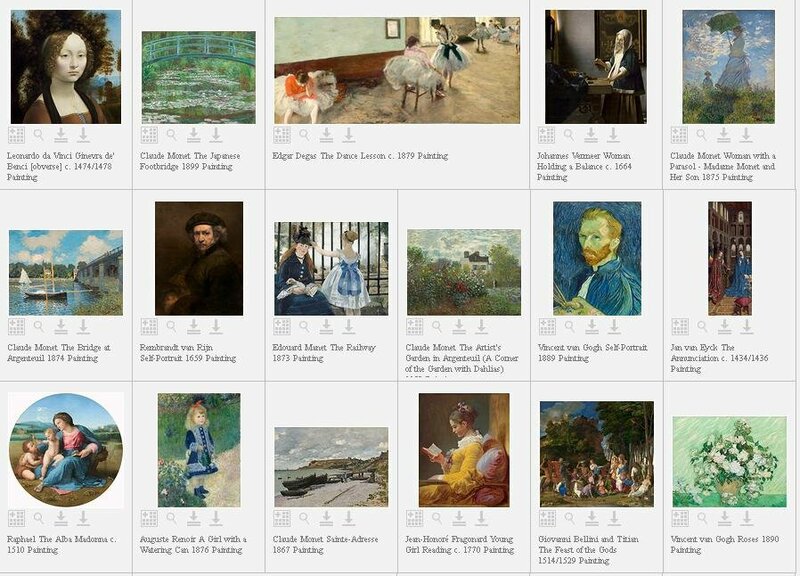 « the attribution of the painting has been the cause of much debate. It is now accepted by virtually all Leonardo scholars. The date of the portrait, generally given as c. 1474, and its commission, however, are still discussed. The sitter, born into a wealthy Florentine family, was married to Luigi Niccolini in 1474 at the age of sixteen. It was a customary practice to have a likeness painted on just such an occasion. Recently, however, the humanist Bernardo Bembo has been identified as a possible patron. He was the Venetian Ambassador to Florence from 1474-76 and again in 1478-80, dates that have been suggested for the portrait. Bembo and Ginevra, both married to others, were known to have had a platonic affair, an accepted convention at the time ». (On the website you can search, browse, share, and download images available free of charge for download and use. NGA Images is designed to facilitate learning, enrichment, enjoyment, and exploration).